The LaserJet P4014 series is one of HP's fastest mid-sized business-class printers. Includes 128 MB RAM, HP JetDirect card for connecting to a network, 100-sheet manual feed input tray, 500-sheet cassette tray. The LaserJet P4014 series is one of HP's fastest mid-sized business-class printers. These speedy printers are ideal for workgroup printing in medium-to-high volume. High-capacity compatible toner cartridges (approx 18,000 page-count) are now available for this P4014n model! 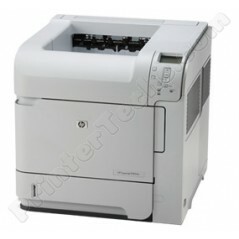 Compare this to the smaller laser printers which use small capacity (2,000 to 5,000 page) toner cartridges. The cost of toner alone makes a refurbished P4014n less expensive to operate than most of the smaller new laser printers. When shopping for printers people usually forget to look at the cost of consumables (toner, maintenance kit, fuser, etc). Printer manufacturers like to sell small, "home-office" printers at low prices. The up-front cost makes the printer look like a good deal, but the cheap printers are simply a vehicle to sell you more toner or ink. The total cost of ownership should be considered. In many cases that "good deal" turns into a headache when you find yourself constantly buying and replacing the small-capacity toner cartridges. 16.5" x 17.7" x 15.5"